Fire up the grill! 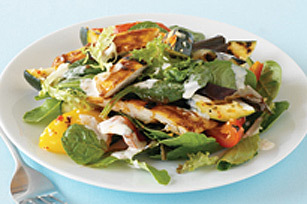 Crisp salad greens and chopped vegetables are topped with BBQ chicken in this simple main dish salad. Grill chicken 4 min., turn. Add peppers and zucchini to barbecue. Grill chicken and vegetables 8 to 10 min. or until chicken is done (165ºF) and vegetables are crisp-tender, turning occasionally and brushing chicken with barbecue sauce and vegetables with Italian dressing. Slice chicken and vegetables. Add to salad greens in large bowl; mix lightly. Drizzle with ranch dressing. Spray barbecue grate with cooking spray or oil before preheating. Prepare using Bull's-Eye BBQ Sauce. Top with your favourite Kraft Shredded Cheese.